Photo courtesy of Brendan C. Hall and ESPN Boston. Ed. Note- We continue our month-long look at the top football recruits in Massachusetts with a profile of Harvard commit Brian Dunlap. 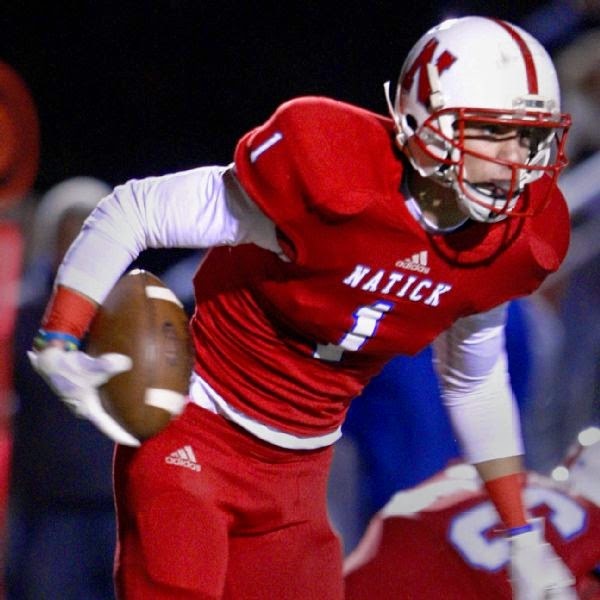 Mike Uva has more on the prolific Natick receiver, who bounced back from injury to dominate Massachusetts high school football again in 2014. It’s hard to find another receiver in the state of Massachusetts that’s had a better high school career than Dunlap. Despite missing his entire junior season due to a broken foot, the Natick star caught a startling 215 passes for 4,020 yards and 56 touchdowns. It’s clear that Dunlap is a hard-worker who took advantage of running numerous routes when playing along side Troy Flutie (now a freshman quarterback at Boston College), as well as learning a thing or two from Darren Flutie (Doug’s brother), as his technique in his route running is smooth. He’s a quick athlete who has some of the best hands in the state. At 6-foot-1, 180-pounds, Dunlap’s size isn’t bad for a receiver, but he definitely has plenty of room to bulk up to increase his strength. Seeing double-digit targets each game at Natick, the biggest difference for Dunlap at Harvard will be having to block more. As much as using a redshirt year could help him improve on those aspects of his game, Dunlap should have the opportunity to compete as a freshman. Keep an eye on this guy the next several years, because he’s surely someone who has the capability to become an Ivy League standout.